Steel gray granite has a grayish backdrop and little black dots and large gray dots speckled on the surface. These inclusions seem like groups of small flowers spread over the granite façade. This granite is quarried in India and it is available in both slabs and tiles in polished form. These polished Steel gray granite tiles and slabs adjoin the beauty to any kind of home décor. There are various qualities of Steel gray granite. This granite is resilient, continuance free, very simple to clean, high weight bearing capability and decent appearance. The unique and aesthetic nature of this granite countertops offer a traditional or contemporary look within your kitchen space. This granite is admired for its charming texture and attractive finish. These granites work amazingly in kitchens, bathrooms and make outstanding countertops and worktops. 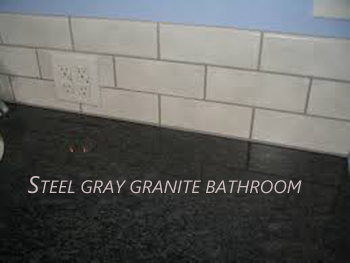 Gray granites are hot choice for bathroom décor. But it enhances when it gets a contrasting color like green. Because, green goes well with gray shades and gives an authentic look. Accents may be used in yellow, white or brown which add sparkle to your bathroom. Designing the room starts from the floor. But in lots of cases, there are limited options for the bathroom. However, if you have chosen the Steel gray granite for decorating your bathroom, then it is better to pick up the green shade as contrasting color. Set up a green colored door-mat which will classify the gray color. If the walls of your bathroom are gray in color, then decorate your bathroom with colorful shelf pieces or towels. It adds extra aspect. There are long varieties of wallpapers. It can be stripes or floral in design. Select such a pattern which is spacious and insert in quite a few shades of green. Steel gray granite vanity tops make a stylish approach to your bathroom. It would be a gallant choice if you use green ceramic tiles for your vanity top. However, installing green shade with Steel gray granite should be an excellent color matching. White will be the safest choice when you are decorating your bathroom with green and Steel gray granite combination. You may use white colored sinks, bathtubs, toilets, basins in your bathroom. You can use these white shaded fixtures in future, when you will remodel your bathroom. Because, white suits well with different colors. A green fern, potted floor plant or jade plant add life to a bathroom. You may utilize the accessories like bath gel, hand soap or toothbrushes which are green or gray in color. Steel gray granite offers an aristocrat and soothing atmosphere in your space. So, you should be careful about the maintenance and cleaning of Steel gray granite. Then it will enhance your home for a long period.